It is always a pitiful situation when we see abandoned vehicles consuming a large amount of precious space on someone’s lawn, or in their garage. Seeing these types of scrap, damaged or busted vehicles on an otherwise nice property is especially disheartening for us. We here at “Wreck Monster” are a group of recognised Car Removal Sydney professionals. Being the leading vehicle removal experts, we make a very large contribution to environmental causes, and the economy. We are willing to remove any scrap automobile at no cost to you. We also pay quick top cash to our customers, of amounts that can climb up to $15K. More about Wreck Monster. Scrap car removal is indeed a more difficult task than it appears. That’s why we use our more than 20 years of experience in removal to successfully take care of all sorts of unwanted automobiles. We have also accumulated a great deal of the skills needed in order to go about wrecking and recycling vehicles in a safe way. This means we use ecologically friendly methods so that every part of the automobile gets disposed of safely. Whether you have an unused, rusty, wrecked or deteriorated automobile, we will still redeem a good amount of money from it by recycling and reusing the parts and materials. When it comes to selling an old or junk vehicle, the best possible outcome one can expect to get is top cash. Keeping this in mind, our experienced appraisers pay the best cash for cars in town. We take great pleasure in being accurate and generous while assessing automobiles. This has also made us the most reliable cash for cars-service throughout Sydney. We have provided exceptional service to many customers, paying a generous cash rate of up to $15K for cars, depending on what condition they are in. By deciding to scrap your old ride with us, you will enjoy quick, dependable and trouble-free services. In fact, it may be safe to say that there is no faster way to sell a vehicle! We are the leading car wreckers in Sydney. Because of this, we have a wide network spanning the entire Sydney area. 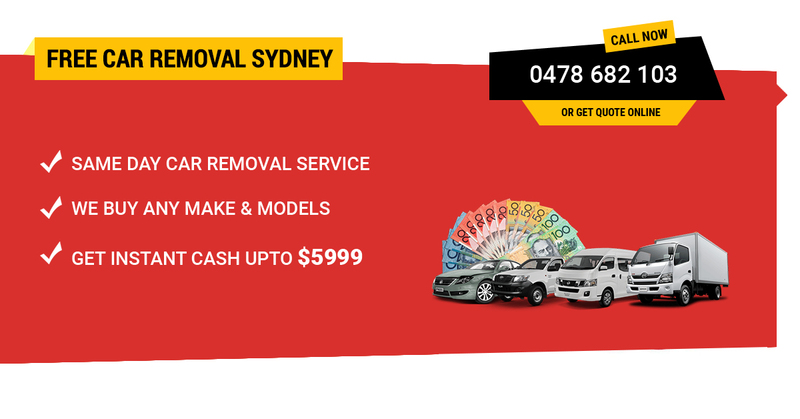 We tirelessly serve the owners of unwanted vehicles everywhere in Sydney with our quality auto removal services. You don’t only get to have your permanently broken down car removed for free. You also get paid sweet cash instantly and on the spot when we come over! There is no way that we will ever reject a car because it is in bad condition. That would be absurd, seeing as we are a junk car buying business. And as we all know, junk cars are universally considered to be in the worst condition a vehicle can be in. We are licensed company and registered Car Removal business operating through NSW. We are so efficient that we will remove any type of car or truck regardless of its condition. It could be fully wrecked or intact; we will be glad to remove and recycle it for good use regardless. Our experts recycle, reuse and resell almost all the components that can be removed from your clunker. And we also have adequate knowledge of government-regulated, eco-friendly methods. This means that the nasty chemicals present in the plastics and fluids in your car will not be harming the local plantlife and wildlife any time soon. We have been a leading part of this growing industry for many years, and as a result, we are highly aware with the ins-and-outs of the automotive industry. Consequently, we keep on hand the latest tools and resources required for handling different junk automobiles. This aid us in properly providing convenient removal for old rusty rides. Our smooth and hassle free removal services are available in all major areas of Sydney West: Baulkham hills, Penrith, Ultimo, Liverpool, Campbelltown, Greenacre, Blacktown, Parramatta, and Richmond. If you need a cash quote, with no obligations attached, we will provide you with one. All you need to do is call us or fill out the quote request form on our website. You can contact us at any time to obtain an assessment and book a free removal appointment for your wheels. It can be very tricky to remove a scrap vehicle from someone’s property, regardless of its make or model. The automobile in question can get damaged while attaching it to the towing equipment and during the transport. But with us, you don’t need to fret about all these troubles. Our removal specialists are seasoned professionals, with a level of skill that ensures the safety of everyone involved, including anyone on the property. Our elite removers will pick up your compact car, truck, wagon, SUV, sedan, van, 4WD or Ute instantly. We don’t have a preference for any specific makes or models of vehicle. We want them all and will pay good money. There is no specialisation going on here at WreckMonster. Whether you have a Honda, BMW, Holden, Isuzu, Ford, KIA, Toyota, Volkswagen, Lexus, Mazda, Nissan, Audi, Daewoo, Volvo, Mercedes Benz, Mitsubishi, Chevrolet, Chrysler or any other make, you can be rest assured that we will haul it off conveniently and within the same day. Of course, only after paying you a handsome amount of cash for it! We focus on giving the fastest and most reliable removal services in Sydney, New South Wales. So, our whole process of assessing, purchasing and removing junk vehicles is very simple. What you need to do is simply give us every crucial information about your scrap wheels. Here is our easy to remember phone number: 0478 682 103, which you can dial at any time. Or, you can also choose the simple way to contact us online. It is completing our free quote form. Whichever option you select, remember to give us your vehicle’s make, model, age and current condition.